To mark the event of Buddha's Birthday lanterns are strewn all over Korea and Seoul, typically centering around temples. Temples all over the country are usually covered in brightly colored lanterns. 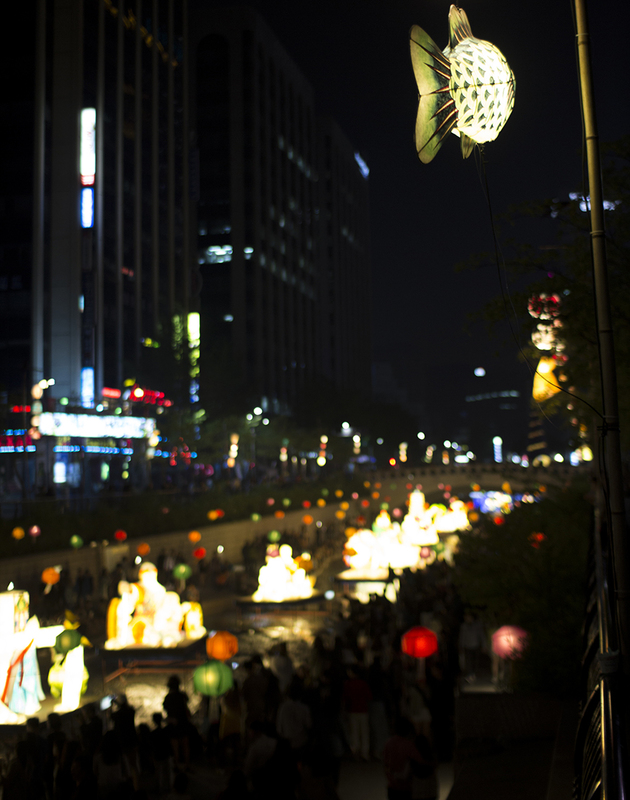 There a lot of events around Seoul to celebrate Buddha's coming, parades, temple events, one of the nicest is the Seoul Lotus Lantern Festival on Cheonggye Stream, possibly my favorite place in Korea. Elaborate paper lanterns really stretch the definition of the word, depicting Korean traditions, wildlife and aspects of Buddhism. A lot of these smaller lanterns can be seen all over the city as well as the country as a whole. The text reads "부처님 오신 날" roughly translating to "the day Buddha came." Seoul is very much a couple's city. Young couples are everywhere doing everything. This may seem like something that is everywhere, but the percentage of people out and about that are couples is without a doubt higher in Korea. Being a beautiful night with perfect weather on a gorgeous stream topped off with colorful lanterns certainly ups your typical couple percentages though. Cheonggye Stream opened up in 2005, prior to that is was actually a highway overpass. It took a lot of time, money and controversy to make what you see now. It's one of the few truly unique features of Seoul and is extremely popular. It's located right in the center of the city, walking distance from palaces, theaters, traditional architecture, bookstores, major government buildings, and a hell of a lot more. It can serve as the perfect beginning or end to a day in the city. The dreaded Monk Pagoda Dragon trifecta. The lanterns are certainly amazing. But this isn't the only lantern festival that goes down on Cheonggyecheon, there's also the Seoul Lantern Festival in November.